When Matthew Biancaniello talks about water mint foraged in Topanga Canyon or seaweed plucked from the island of Saint Lucia, it’s difficult to tell if he’s talking about ingredients on a plate or in a glass. It’s no surprise, considering the self-taught barman has forged a career in L.A. around the invitation to “eat your drink” (he even cowrote a book with that name); he showcases herbal, vegetal, fruit-forward, and highly seasonal cocktails that sometimes look like salads in a glass. Now, after years of pop-ups at local bars and restaurants, he’s opened a place of his own. In true Biancaniello fashion, it blurs many lines. 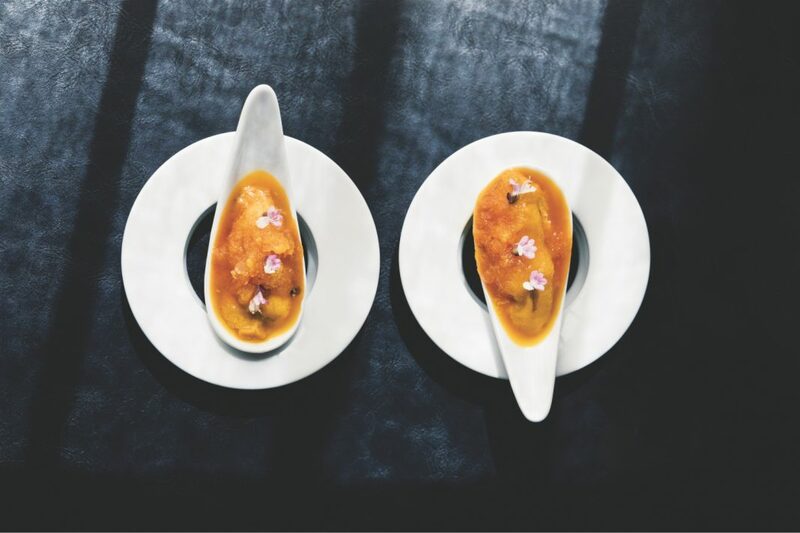 The 12-seat “liquid omakase” bar sits in a quiet corner of the sprawling Calamigos Beach Club, an offshoot of the ranch resort hidden in the rugged Santa Monica Mountains above Malibu. Most locals know the building as the former BeauRivage restaurant, an eye-catching white villa along Pacific Coast Highway. Although technically a part of the beach club, Mon-Li is open to the public, or at least to anyone able to snag tickets to one of two seatings on the nights it’s operating (currently Thursday through Saturday). Inside the tasting room, bouquets of dried sage, flowering chives, and Thai basil—items found at farmers’ markets, in home gardens, or along creeks and trails in the hills—hang from rustic wood beams. Along the walls, glass jars are filled with dried cactus fruit, Biancaniello’s famous nocino (a dark liqueur made from green walnuts), and ash from the Thomas Fire that ravaged Ventura County in 2017. “I’m going to use that in hot buttered rum this winter,” he says casually. Biancaniello is both barman and chef, a mad scientists of sorts, creating drinks in little oil-and-vinegar cruets or as liquor-soaked sponges atop sea urchin shells. There’s a Persian mulberry old-fashioned with almond liqueur, smoked sage tequila, cactus pear vinegar, and hay beer he brewed himself. A layered cocktail might involve three white vermouths infused with romaine lettuce, Parmesan rind, and anchovies—a sippable Caesar salad. There’s no ingredient he won’t try to turn into a cocktail, and no spirit he won’t try turning into food.